Glasgow Lofts offer splendid views over the city, as far as the green fields beyond. They also set up luxury stays in serviced apartments leaving guests in need of nothing. Floor to ceiling windows mean the light floods through the double glazing into the chic, modern designed rooms. Beds are snug in Egyptian cotton sheets. And the kitchens have every convenience right to hand. For exploring Glasgow, all guests have to do is step outside. Theatres, restaurants, designer shops, bars tourists attractions, travel hubs and the business district are all within easy walking distance. For a truly different experience of Glasgow, along with amazing views, these deluxe apartments have it all to look forward to. 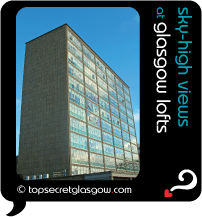 Grab your very own web page all about Glasgow Lofts. Do you have a special story about Glasgow Lofts? A funny experience? A grand occasion? A funky photo? A personal tip? A top secret?